I think that the minority of pro-khalistan people are literallly pro in the sense that they actually want a singular sikh homeland. But a lot of khalistanis want change, big change but remain in India somehow. Im one of those. We want change to such an extent that we finally do get some independance. I think Khalistan could only really work by ruling all of India, which the Great Singhs once did. 250,000-1,000,000 Sikhs killed, whom since their inception, rightly or wrongly are as patriotic as anyway a subjected to Hitlerequse rule and torture = No right to there own country. I can understand where you are coming from but the truth is India has too much corruption in it's politics for any of the stuff you mentioned to happen, especially your points about the justice for sikhs who have suffered and taking Badal and BJP to court. All the points that you have said are correct and I agree with them, all I am trying to say that it is very unlikely to happen. Guru Nanak is the most widely travelled prophet in history. This is a fact. He made five Udasis (journeys) guring his lifetime. No other religion's founder travelled anywhere near the distances that he travelled. Jesus, Muhammad, the Buddha etc. don't even come close. This map shows the areas, where we have undeniable evidence, universally accepted by historians worldwide, that Guru Nanak travelled to. The above pictures show the Gurdwara built in Baghdad in honour of Guru Nanak. 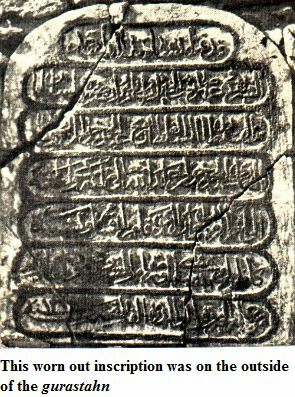 The Arabic inscription proves that Guru Nanak went there. Even today there are several disciples of Guru Nanak in Iraq. These people live on the banks of the Tigris river, particularly in the cities of Al Kut and Baghdad. They are called Sobi and generally they are gold-smiths by occupation. They are experts in their trade. They keep long hair, do not cut their beards, brush their teeth with a dantan (like a miswak, but from a nim tree) and remember the Guru by name of Baba Nanak. There are many people in Uzbekistan who are followers of a "Wali Hind" (protector from India). They state that his name is Nanak and that he was accompanied by a companion playing a stringed instrument (this was Mardana). Many other Arab countries, such as Syria, have followers of a "Wali Hind" came to teach them three things - Remembrance of one God; Hard, honest work; and the importance of sharing one's earnings. These are the three pillars of Sikhism, therefore it was Guru Nanak who taught them these things. 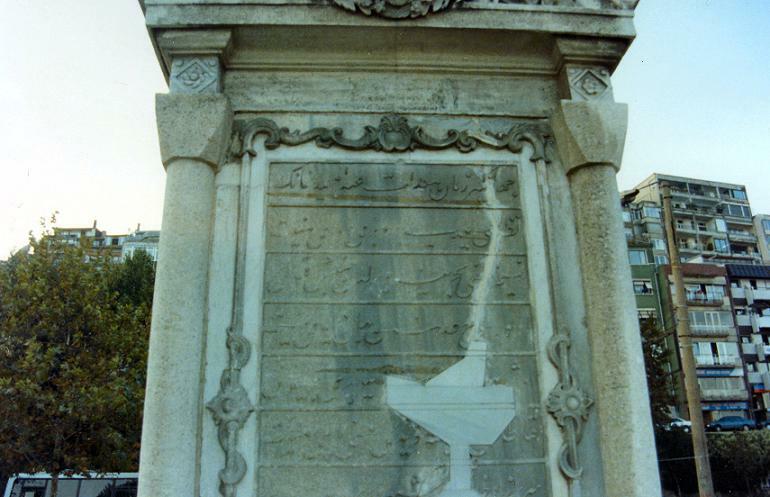 This monument is in Istanbul, Turkey. The writing shows us that Guru Nanak came there to reform the people. A new discovery now suggests that Guru Nanak may have travelled as far as East Africa. A small settlement, a hundred miles from Kampala, Uganda, is named ‘Bamu Nanika’ (Bamu may be a short form of Baba Mungu – Mungu means God in Swahili) which the locals there revere for it’s spiritual powers. They say that a holy man, not one of their own, sat on a certain spot there and meditated. The spot is covered in a bark-like material and not shown to anyone. Prayers are done in their traditional way. It is also said that all of Uganda’s Kabakas (traditional kings) visited the ‘shrine’ to receive blessings upon their advent of rule. The area is arid with no fresh water for miles. But only a few hundred meters away is a small spring of fresh water which the locals do not allow anyone to drink or wash hands with. The water is somehow used like ‘giving amrit’ to devotees who are all Africans. When asked about who they revere the place for, the locals say that, ‘He is not one of ours but there is some great spiritual power here’. Obviously I cannot go through all of the places that Guru Nanak visited, but this is a short introduction into an ocean of history. It's very interesting if you look into it. Guru Amar Das continued the expansion of Sikh Institutions. He trained a band of 146 masands (52 of whom were were women) and sent them to various parts of the country. He also set up 22 dioceses called manjis across the country. He gave people education, both in spiritual and worldly matters, through this. Guru Arjan also sent masands to areas such as Afghanistan, as well as preaching himself. Guru Gobind Singh said, "When I became a Spiritual Sovereign, I spread Religion to the best of my ability." So when did it stop? Why are Sikhs so hesitant to do parchaar (preaching) nowadays? After Guru Arjan's martyrdom, it became increasingly difficult to preach. It was illegal to be a Sikh, hence any form of preaching would be dangerous. Also, people could be questioned, tortured, and put to death, for associated with the Sikhs. Therefore, preaching was only around in Sikhism for ~100 years. This compared with, for example, Islam's preaching years is quite a short period of time. Also, people are attracted to power. Nobody listened to the Christians until they had statehood and money. The same can be said for Muhammad, who only had a maximum of 150 followers pre-Hijra. During the Misl period, the Sikhs were living in th jungles because they had been driven out of the towns and cities due to persecution. Therefore preaching could not take place at this stage. Preaching was officially stopped during the reign of Maharaja Ranjit Singh, because he was worried about offending the Muslims who were now being ruled by the Sikhs, after the collapse of the Mughal Empire. The British were already in India by the time of Guru Tegh Bahadur. The British further discouraged the practise, because they did not want Sikhism to branch out into other races. This is because they didn't want the Sikhs to get to large in numbers, and they wanted to dismantle the Sikh faith to prevent any uprising or rebellion. They also believed Sikhs to be a "martial race," and hence thought Sikhs of other races would interfere with this. They wanted to use Sikhs for their own gain. You need to believe in one God, but it does not matter what name you call it by (eg. God, Allah, Yahweh, Waheguru etc.) They are all the same thing. Modern day Sikhs are still used to not talking about their religion, and we've lost our incentive to preach. They are scared of Sikhism turning into what Islam has become (ie Zakir Naik etc). Quote me if you want me to clarify that point. What I said, was its incorrect to say alcohol is bad period. We now know it to have some beneficial properties, and both islamic and hindu scriptures acknowledge this fact. They don't say 'alcohol is bad, avoid it', they say alcohol has both good and bad properties and in Islam at least, goes on to say that the bad outweigh the good, thus it is prohibited. Read what I posted again, and you'll see what I mean. Sikhs are more against the state of being drunk, rather than health issues. To me, it seems like a religion meant for the people around its founder, not humanity. From these quotes, I think it is obvious that our religion is applicable to all peoples at all times. Don't criticise him for asking questions. It's better he comes here and asks questions, rather than spread lies and misconceptions to the masses who have little or no idea of what Sikhism teaches and what our principles are. I do understand your feeling though. On the internet at least, it seems to be Muslims who are the unanimous critics of Sikhism. That problem has many strands. National Crime Records Bureau says over 200,00 farmers in Punjab have committed suicide since 1997 due to the fact that they are heavily in debt and unable to repay their lenders. Punjabi farmers are also going through a water crisis in which the Indian government has restricted water rights for irrigation, making it extremely inefficient and expensive for farmers to maintain their crops and land. The Government has also allowed for the usage of unregulated pesticides and fertilizers to counterbalance the low productivity resulting in major health problems in the people of Punjab. However, there has also been bad weather in Punjab oer the past decade due to global warming, which has limited the growth of crops. Khalistan would do nothing to solve this. Also, this problem is happening all over India, not just in Punjab. Khalistan is not a "perfect" country. They could just as easily make the same mistakes the Indian governmnet has made. Khalistan would need a huge amount of money to be created, which would increase the tax burden on farmers, and hence reduce their profits. This defeats the point of Khalistan. Khalistan could not happen now. Punjab is in too much of a mess. There is now point just making a country and calling it "Land of the Pure." The people have to be pure too. Right now, Punjab has the highest rates of drug and alcohol abuse, despite being one of the smaller states of India. Do you really think these people are pure? Do you really think they can form the foundations of a country? Don't get me wrong, I think Khalistan should happen. It's just that Punjab isn't ready for it just yet. I'm sorry, I thought this was the Ask About Sikhism thread. If you don't like it, leave. Thanks for your replies, but you haven't answered any of my questions. Copying and pasting quotes from people about Sikhism is a pointless exercise as you could find an equal and great number saying the same thing about any religion, so I'm going to ignore it. I will look at the above quote. All the prophets said that, what makes Guru Nanak special? As for your previous post, Im not sure why you point out that Guru Nanak was the most widely travelled 'prophet' as a point of note. He may very well have travelled to neighbouring regions, but what do we have to show for it now? Not much. Was his travels for the purpose of his own enlightenment or to spread his message, because if its the latter, he didn't do a very good job of it considering Sikhism is pretty much confined to the Punjab of India (ignoring the dispora). Its all well and good saying Guru Nanak travelled to such and such a place (although some of your 'evidence' is desperate at best), but while he was extensively travelled, his message clearly was not. This is where the problems begin. Listen, I as a Sikh, have been taught to never question another religions prophets ever. I don’t. In a nutshell, that is one of the great things about Sikhism. Also, you seem to, in every post somehow think you can question the credibility of the greatest philosopher in the world history, the leader of Sikhism, the wisest of them all, Sahib Sri Guru Nanak Dev Sahib Ji. How many years has Christianity been around, and how many followers has it got today? How many years has Islam been around, how many followers has it got today. Sikhism is barely 700 years old? On a proportionate basis it is hardly doing badly at all. We don’t actively pine for converts. The crucial message of Sikhism is hukam. You follow the order of the Waheguru Sahib Ji. If God wants you to be Sikh, you will be. If God wants you to be Muslim, you will be Muslim, you don’t challenge it. That sentences about “Sikhism is pretty much confined to the Punjab of India” is irrelevant. The reason why Sikhism is special: it is the only religion which has a living prophet, which was, TRUE AT THE TIME OF THE GURU SAHIBANS, IS TRUE NOW, AND WILL BE TRUE IN 1,0000000000,0000000000000000000 0000000000000^infinity years time. You've replied with your heart not your head. That's great, but not what I'm looking for, so leave it to the other poster. In fact, I don't even care all that much tbh, so if it grates on you so much, I'll leave you to it. Enjoy. Just do not understand where Sikhism derive their doctrine from. Could you provide any good website, so that I could look into it? Thanks.. Copying and pasting quotes from people about Sikhism is a pointless exercise as you could find an equal and great number saying the same thing about any religion, so I'm going to ignore it. I will look at the above quote. All the prophets said that, what makes Guru Nanak special? Well I think the words of a reputed scholar or historian carry more weight than my own. That's like me asking you "What makes Muhammad so special?" "Within the mind are gems, jewels and rubies, if you listen to the Guru's Teachings, even once." As for your previous post, Im not sure why you point out that Guru Nanak was the most widely travelled 'prophet' as a point of note. It shows that he actually believed in what he was talking about. He may very well have travelled to neighbouring regions, but what do we have to show for it now? Not much. Was his travels for the purpose of his own enlightenment or to spread his message, because if its the latter, he didn't do a very good job of it considering Sikhism is pretty much confined to the Punjab of India (ignoring the dispora). "....Rukan Din asked Guru Nanak to open and search in his scripture whether Hindu is greater or the Muslim. Guru replied that without good deeds both will have to weep and wail. Only by being a Hindu or a Muslim one cannot get accepted in the kingdom of God. As the colour of safflower is impermanent and is washed away in water, likewise the colours of religiosity are also temporary"
I don't see how a stone memorial with Guru Nanak's name engraved into it for centuries is "desparate." Zakir Naik is essentially humiliating himself. He is practically begging people to come to Islam, and lies through his teeth on literally every lecture. He does not come across as a respectful man. He lies and misinforms people. This is not the way to spread your religion. Do you mean where the Guru Granth Sahib came from? Who wrote it? The Guru Granth Sahib's authenticity? Thus, the Guru Granth Sahib is derived from God. "The Sikh religion differs as regards the authenticity of its dogmas from most other great theological systems. Many of the great teachers the world has known, have not left a line of their own composition, and we only know what they taught through tradition or second-hand information. If Pythagoras wrote any of tenets, his writings have not descended to us. We know the teachings of Socrates only through the writings of Plato and Xenophon. Buddha has left no written memorials of his teaching. Kungfu-tze, known to Europeans as Confucious, left no documents in which he detailed the principles of his moral and social systems. The Founder of Christianity did not reduce his doctrines to writing, and for them we are obliged to trust to the Gospels according to Matthew, Mark. Luke, and John. The Arabian Prophet did not himself reduce to writing the chapters of the Quran. They were written or compiled by his adherents and followers. But the compositions of the Sikh Gurus are preserved and we know first hand what they taught. They employed the vehicle of verse, which is generally unalterable by copyist, and we even become in time familiar with their different styles. No spurious compositions or extraneous dogmas, can therefore be represented as theirs." The Guru Granth Sahib was written by the Gurus themselves, thus our scripture has been preserved. We are unique in this respect. Just thought I'd back this point up with evidence. All Sikhs are ordained to accept the Granth as their Guru. Accept the Guru Granth Sahib as the body of a present Guru for all ages to come. Let him search through the hymns of the Guru Granth Sahib. The Khalsa shall rule, and there will be no one to resist them. Those who are separated will be united, and all the devotees shall be saved. Yes, but each side can and will find quotes by historians that favour their own agenda. Hence why I am ignoring them all here. You misunderstood my point. Im sure Guru Nanak was a lovely person, but there have been many lovely people before him. As a founder of a new religion, what makes Guru Nanak so special? As far as I can tell, he did not come with a message that was particularly revolutionary, nor one that we haven't heard before. I don't see how the two are linked in any way whatsoever, and quite odd that you should even offer such a reason. Why do you think this? If he felt his way of life was the best, you would surely expect him to preach it to others no? You're making it quite unclear as to what Gura Nanak's purpose was on Earth? Did he come to spread Sikhism? "This monument is in Istanbul, Turkey. The writing shows us that Guru Nanak came there to reform the people." I find it pretty cheap that you should to resort to personal attacks that are unwarranted, so I won't entertain you there. However, this is a really poor argument from you. Sikhs don't want to preach for fear of becoming like Zakir Naik?! For this to be a valid reason we would have to assume Naik's way of preaching is the only way, and has been the only way of doing it. What you are essentially saying is that Sikhs are afraid of preaching for fear of becoming lying, cheating, shameless crooks in the eyes of others. Not much confidence in your co-religionists there is there? This therefore still leaves the question, why don't Sikhs preach? Thus, we believe that the Gurus had revelations from God, therefore the Guru Granth Sahib is derived from God. "For I have not spoken of myself; but the Father which sent me, he gave me a commandment, what I should say, and what I should speak. And I know that his commandment is life everlasting: whatsoever I speak therefore, even as the Father said unto me, so I speak." He does not speak out of his own desire. It is naught but revelation that is revealed. Your holy book, is it the the unadulterated word of God? You believe you have a present day living prophet? (Why do you use the term prophet?) Who is he? With all due respect, are you actually against the Sikhism? It seems that all your points are to refute this religion per se. No. where is this indicated in his post? I'm sure you can google and you'll see millions of links. Yes, unlike the Bible and Quran it was written by the Prophets themselves as instructed by Allah. No versions were compiled and later altered as the Quran was by the Caliphs. The Guru Granth Sahib is the "prophet" you are refering to, not a person. Well a prophet by definition reveals prophecies. The Guru Granth sahib reveals prophecies, hence this wording is justified. Although I should mention that this does not mean that the Guru Granth Sahib is worshipped in any way. God and the Gurus are distinctly separate, and this applies to the Guru Granth Sahib. The human Gurus were never worshipped, hence we should not worship the Guru Granth Sahib. If we did, then that would be bordering on idolatry, which we are forbidden to perfrom. This is what I'm starting to think, but let him ask questions. I don't mind. These are all new aspects that other religions at that time had not come up with. There are of course many other areas in which Sikhism deviates from other religions. He came to spread religion in general. And by religion I mean monotheistic worship. His work with Muslims only involved clearing up hypocrisy and getting them to focus on their religion, rather than money etc. He did a lot more with Hindus, who were ruining themselves in idolatry. It wasn't a personal attack, it's a fact. There will always be people who take it too far, and you know that as well as I do. Maintaining your honour and dignity is very important to us. Over the years, Sikhs have gained a lot of respect for not shoving our religion into people's faces at any given opportunity. Many atheists have told me this. To lose that respect would be a set back for us. In fact, I know many Muslims who disaprove of Naik's Qur'anic acrobatics. One of my Muslim friends went so far as to call him a Kafir (disbeliever). They say he is not quaified to interpret the Qur'an how he wills, as he is not really that great a scholar. He just makes a big show out of it to herd people into Islam They dislike his methods. I've already answered this. My answer will not change no matter how many times you ask me. I don't think you are at all unique. Increasingly we see similarities between Sikhism and those that came before it. For example, your story of the revelations to Guru Nanak are just a copy of what's come before: God speaks to his messenger, messenger conveys the message of God to the people, includes a book in their too. This argument doesn't make sense. If all religions are like that (which is what you are saying), then what's your point? What's the alternative? I think we should celebrate the fact that our religions have similarities, not fight over them.At least we have a common basis from which all our actions are based on. Wouldn't the world be terrible if all religions were completely at tangents to each other? They would be constant fighting and bloodshed. And tbh with religion, you can't really break away from the crowd. All religions teach you not to steal etc. etc., therefore how different could Guru Nanak realistically be? and I could say the same about any religious founder, incuding Muhammad. It doesn't say anything about that religion. We have more proof than anyone else, so yes.